RGU news posted last week that we had a stand at the Satrosphere on Saturday 17th March – Robot croquet: Discovery Day to encourage kids to explore science and engineering. Here’s a brief summary of the day and it looks like we were quite the attraction. The Croquet Robots exhibit, jointly representing IDEAS and the School of Computing, took place at Satrosphere on Saturday as part of National Science Week. Our main exhibit consisted of the croquet pitch and Lego robot set-up and a separate small exhibit with ePuck robots. Both exhibits were interactive and went down very well with the (mainly primary aged) children who attended. We were sited next to the cafe on the ground floor and had a high throughput all day – with quite a few repeat visits! 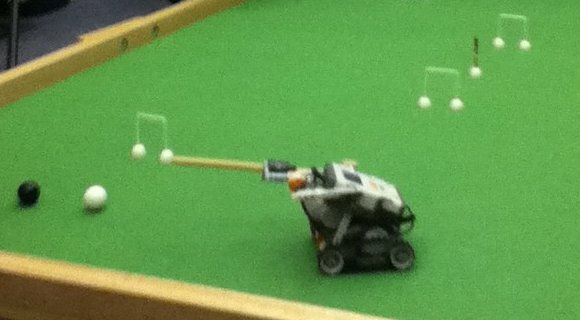 The children really enjoyed controlling the croquet robot and letting the ePucks follow their hand and respond to clapping. We also had positive feedback from the organisers and the Satro team. Thanks goes out to all the people involved in the event. Olivier Regnier-Coudert and John McCall for the presenting, Jose Lloret-Perez and Claire Gerrard for programming the ePucks to do fun things at short notice, Colin Beagrie and Susan Frost for organising and preparing all the computers, cables and other equipment, Virginia Dawod and Duncan Lockerbie for administrative support (not least finding a larger van at very short notice!) and Sarah Grieve for composing the press release.